Home Julian Lennon Julian Lennon: Too Late for Goodbyes? What has Julian Lennon been up to lately? I had to do some research because it’s been ten years since he released his last album (Photograph Smile) and because I’ve been listening to songs from his first one, Valotte, which was so darn good (my favorite track is Say You’re Wrong.) Julian was a babyfaced cutie when we got a taste of his talent in the mid-80s. Remember the music video for Too Late For Goodbyes, which featured a leaping hippie figure suggested by many to represent his late and famous father John Lennon? I watched it on YouTube recently and had forgotten how young Julian was. His voice, looks, and songwriting ability, so uncannily like his dad’s, are still as disarming as the first time we were introduced to him just a few short years after his father was killed. His story is one for the “where are they now?” specials. The media instantly latched onto Julian’s strong resemblance and famous last name but I seem to remember that throughout the interviews he gave to teen magazines at the time, he handled it all with class and tried to distance himself from his musical predecessor. Who could blame him, given the fact that of both Lennon sons, Julian was unfairly given the short end of the sibling stick. Julian was an unplanned baby and John was all but forced into marrying his mother Cynthia. He recalls that John once told him he “came out of a whiskey bottle on a Saturday night” and that Paul McCartney was the Beatle who spent the most time playing with him. When Beatlemania swept the world by storm, the public didn’t know that Julian and Cynthia even existed, as it was believed the knowledge that one of the Beatles had a wife and child would be detrimental to their image. He was treated badly by Yoko Ono – even after John’s death - and was pretty much left standing in the shadows after Sean was born. Photograph Smile was dedicated to Julian’s late stepfather, the man that Julian says was more of a father towards him then his real dad. Valotte was a huge hit for Julian, and three hits songs came from the album. His follow-up album flopped however, and Julian soon sought solace in alcohol. He had a tiny role playing, ironically, a bartender in the movie Leaving Las Vegas. The good news is Julian has a new album coming out this year, and his website will be relaunched to coincide with the release. He got married a few years ago (ironically, to a woman named Lucy) and seems to have turned his life around, away from the spotlight. And if you ask me, of the two Lennon sons, he runs rings around the whiny, weird, effeminate-voiced Sean – a kid who once proclaimed that he didn’t even like Beatles fans. 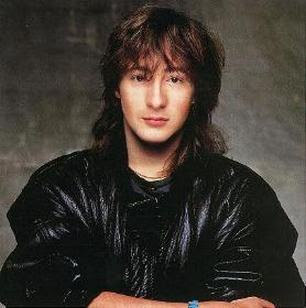 I’m totally psyched for a Julian Lennon comeback. I liked Valotte too, he really does sound like his father...thanks for the update!